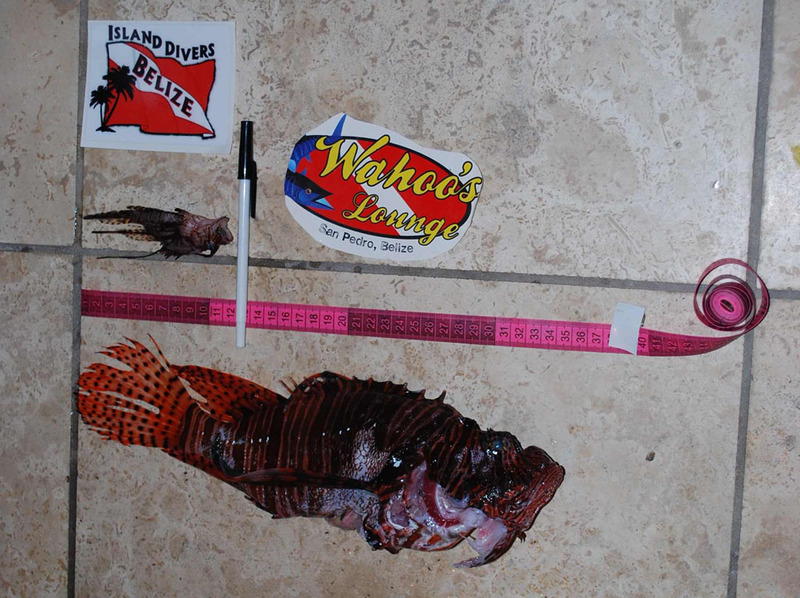 The fight to rid the Belizean waters of the invasive lionfish continues and Wahoo’s Lounge has teamed up with other stakeholders like Hol Chan Marine Reserve and the San Pedro Tour Guide Association to fight the mighty fish. Together, their efforts have encouraged dive shops and individuals to capture, cook and eat these fishes. While the lionfish pose a huge threat to our waters they do provide for very delectable dishes. 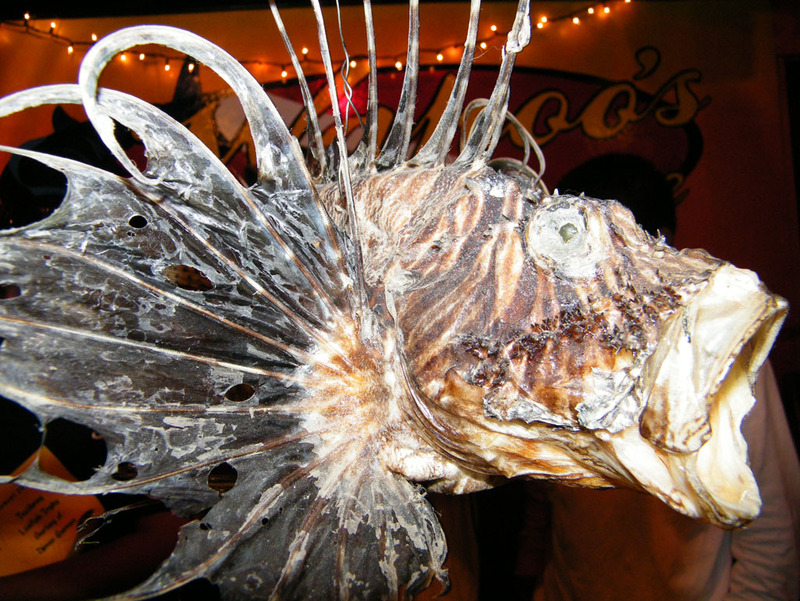 Organizer of the lionfish tournament and cook off, Mr. Doug McLain explained, “The lionfish is a predatory species introduced into these waters by accident and have no natural predators whatsoever, in fact no other fish is known to eat them in these waters. They also breed very quickly and live up to about sixteen years. There’s an astronomical amount of eggs that they lay every week and they mature sexually very quickly. They eat an incredible amount of juvenile fish which is all of our reef fish. At some point all of our snapper and grouper and all those fishes that we love will be eaten up if these fishes are not destroyed. 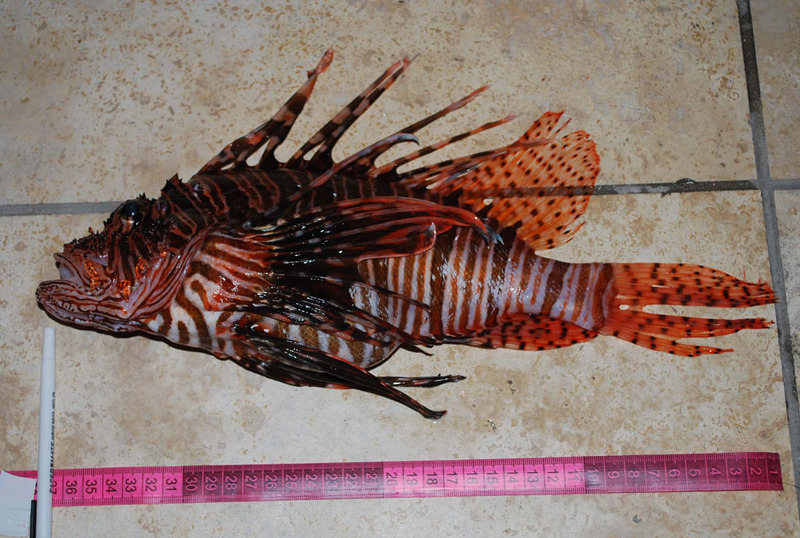 Eventually what we’re going to end up having is a dead reef full of lionfish and nothing else”. This species of fish also poses a huge threat to the tourism industry considering that our Barrier Reef is a huge draw to the county. 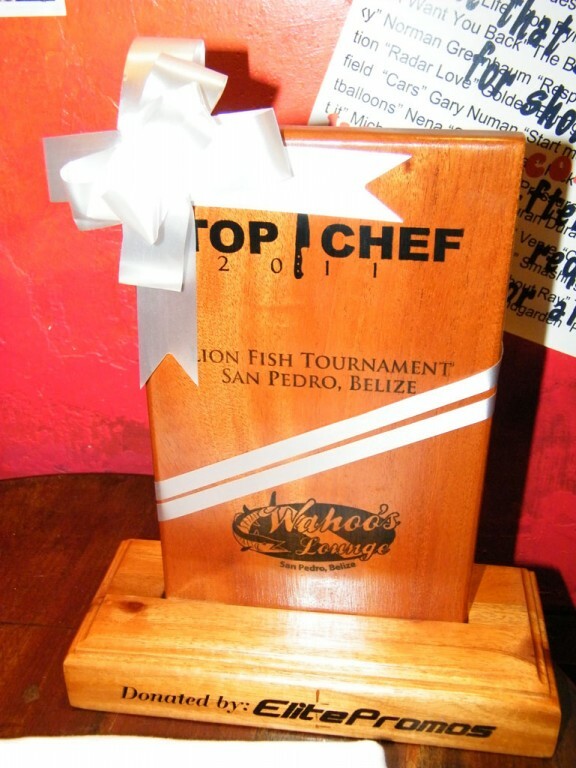 The tournament to capture the fish was held on Saturday December 16th with measuring done at 5PM at the Wahoo’s Lounge. 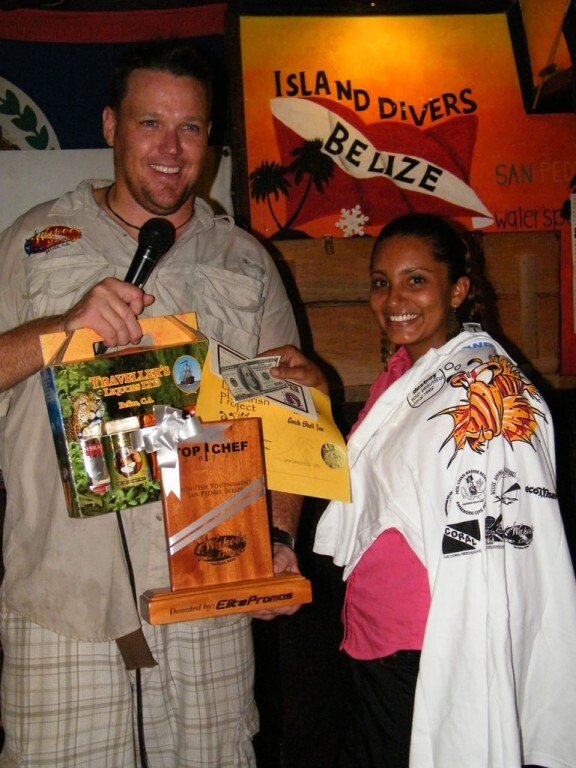 Prizes were given for three categories: the largest fish, smallest fish and the most fish caught. 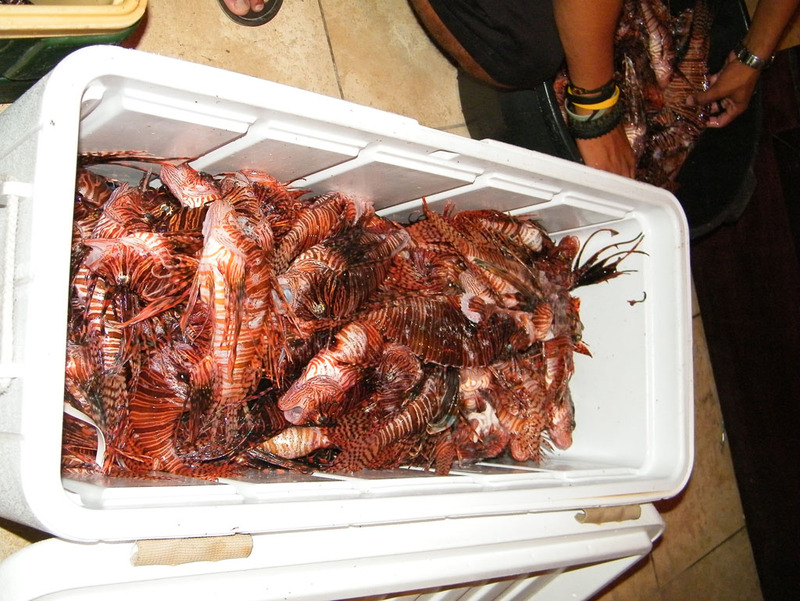 In first place was Island Divers for capturing 167 lionfish. 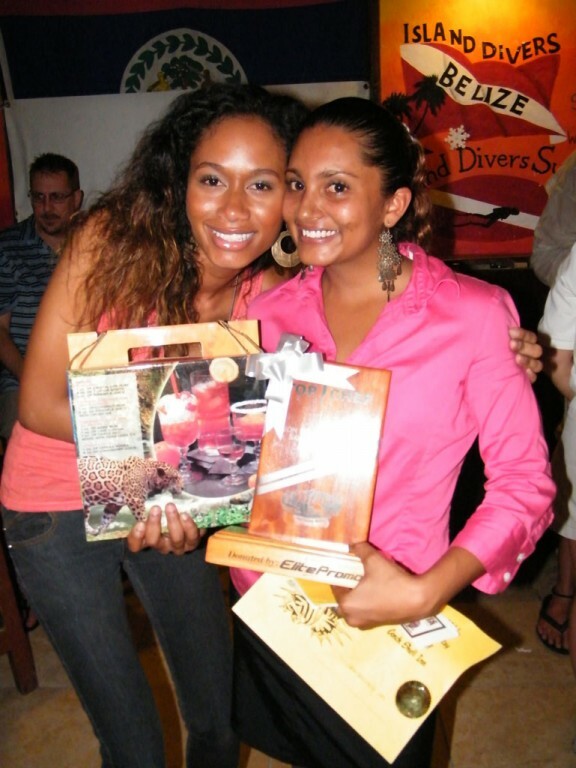 For this they won an overnight stay at a private villa with private chef, Chef Mar available to cook up their catch; two round trip tickets to Belize City courtesy of Tropic Air; $400 courtesy of Ambergriscaye.com and a taxidermy lionfish trophy courtesy of Mr. Dimas Guerrero. 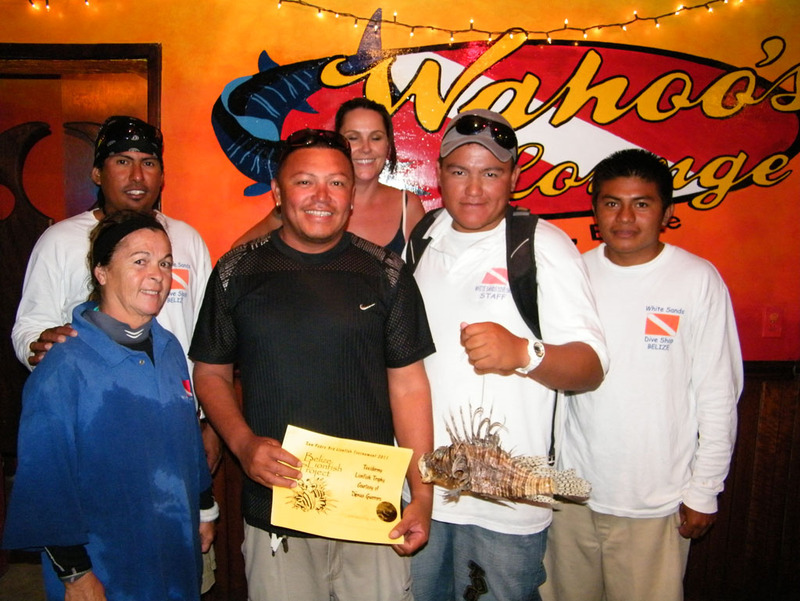 Capturing second place for the largest fish, measuring 37cm was White Sands Dive Shop. 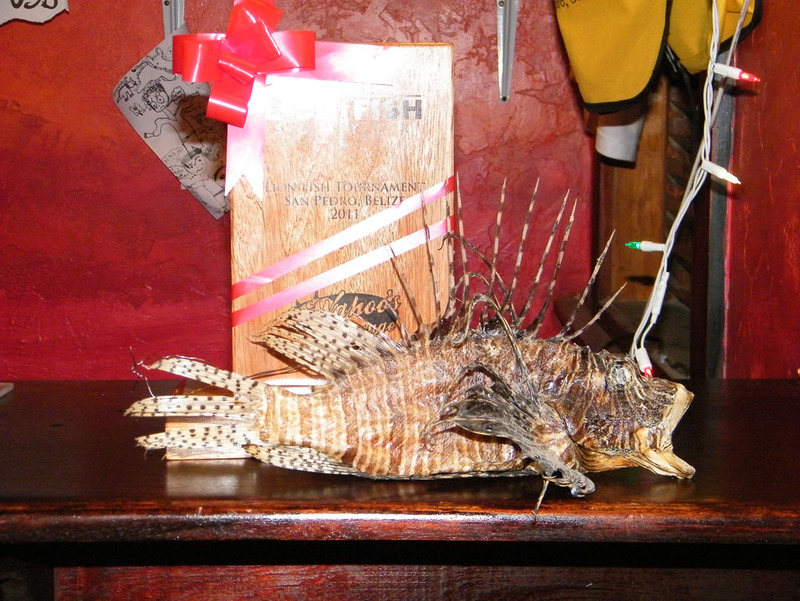 The team won a taxidermy lionfish trophy courtesy of Dimas Guerrero, $300 cash courtesy of Franky & Lovie’s Lake of the Ozarks and dinner for two courtesy of Rojo Lounge. 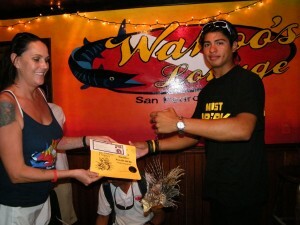 Third place also went to White Sands Dive Shop, for capturing the smallest lionfish, which measured 9cm. 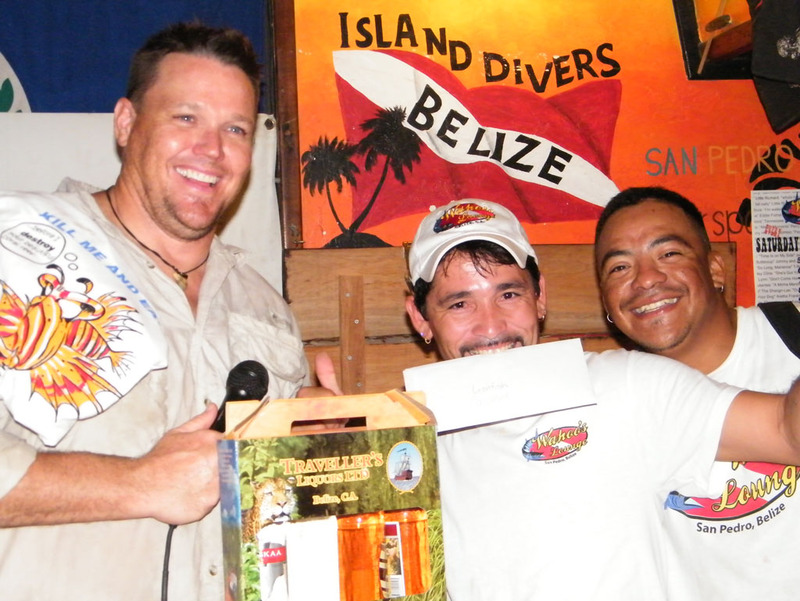 For capturing the smallest lionfish, the team took home a snorkel and mask courtesy of Island Divers Belize, $100 cash and a t-shirt courtesy of Wahoo’s Lounge. 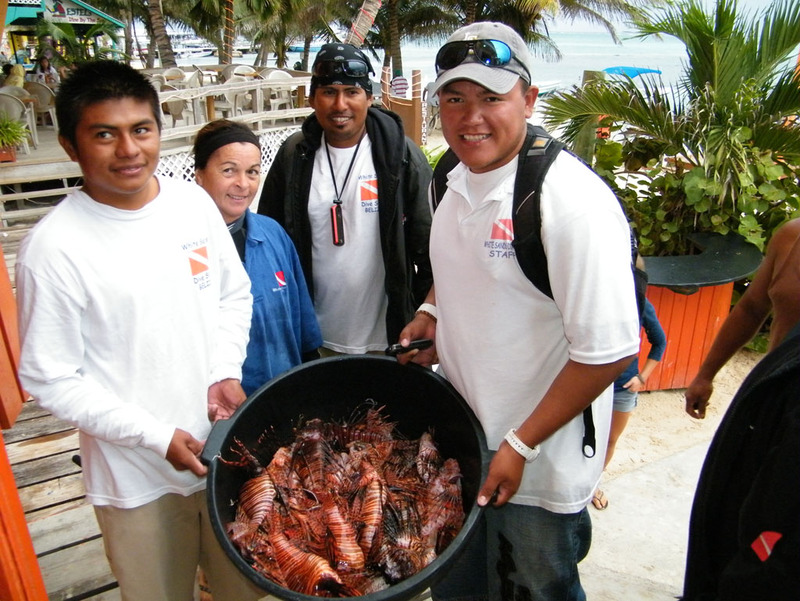 With the tournament over, chefs from across the island were invited to pick up a batch of lionfish for the cook-off scheduled for the following day. 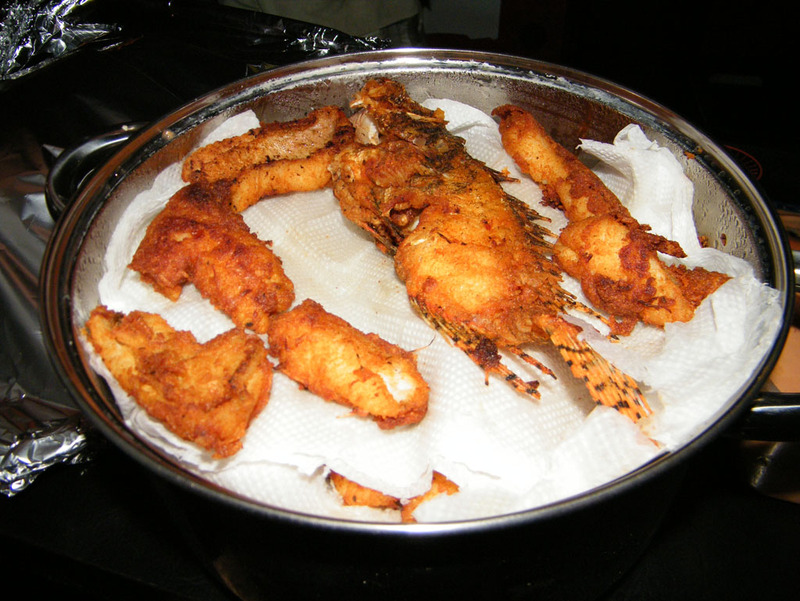 Four chefs took the challenge to prepare the lionfish; Chino of Wahoo’s Lounge, Waruguma, Crave Restaurant and Chef Mar. The food was presented for tasting at 5pm on Sunday, with three main judges and a couple secret votes. 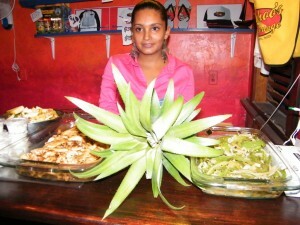 Chef Mar was the first to have her creation judged. 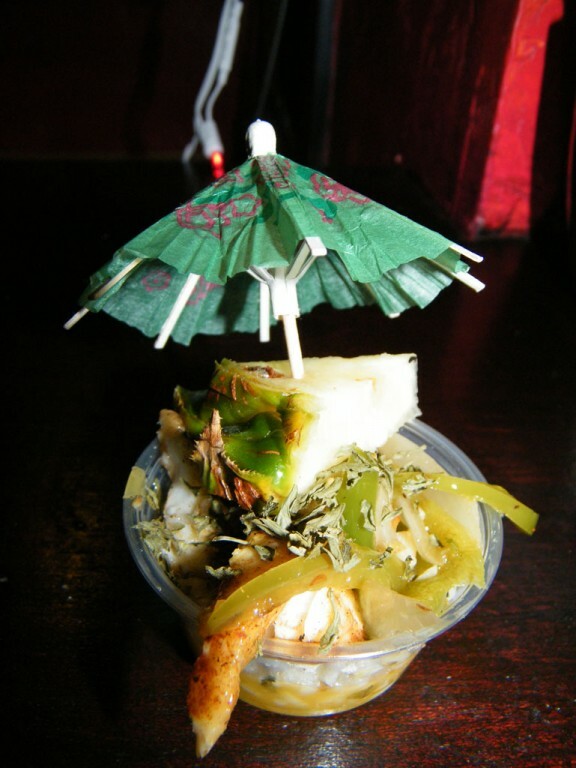 She went creative and concocted a Piña Colada Lionfish dish. 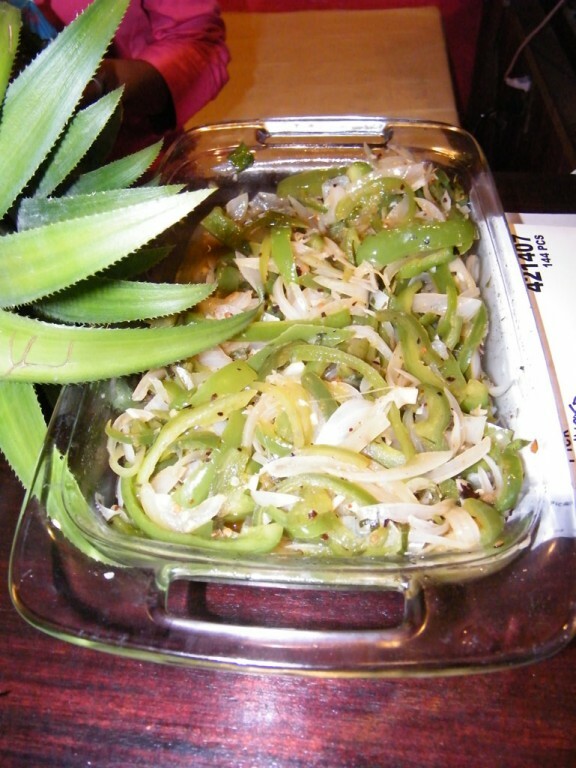 This involved thinly sliced lionfish filets marinated in a pineapple and ginger sauce for 15 hours, laid on a culantro coconut rice layer, topped with onion and bell peppers in a spiced rum sauce. 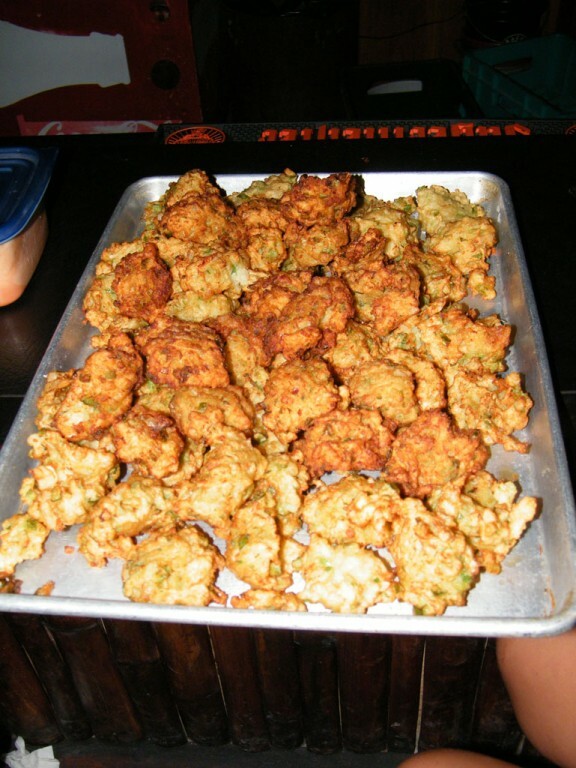 Crave Restaurant prepared a lionfish fritter dish served with a spicy seafood dipping sauce. 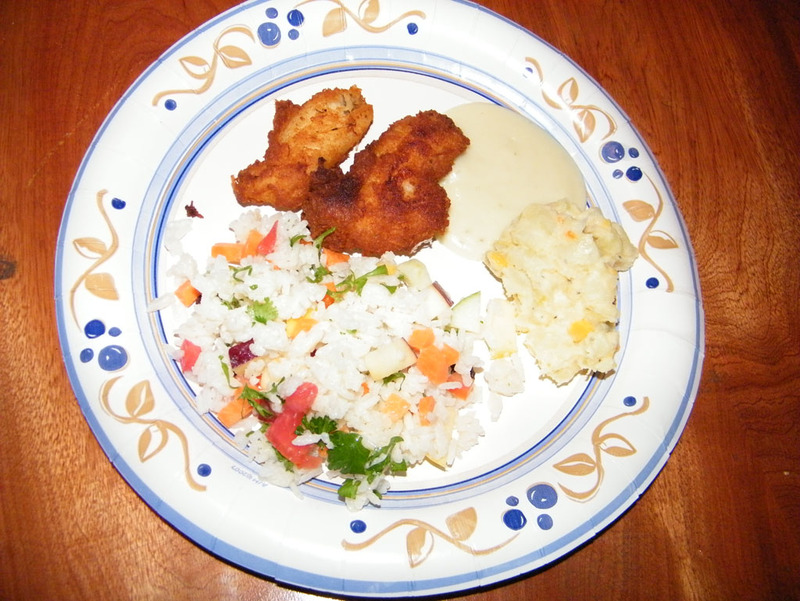 Waruguma fashioned a lionfish wrapped in cassava with a coconut cream sauce served with colorful Christmas rice and potato salad. 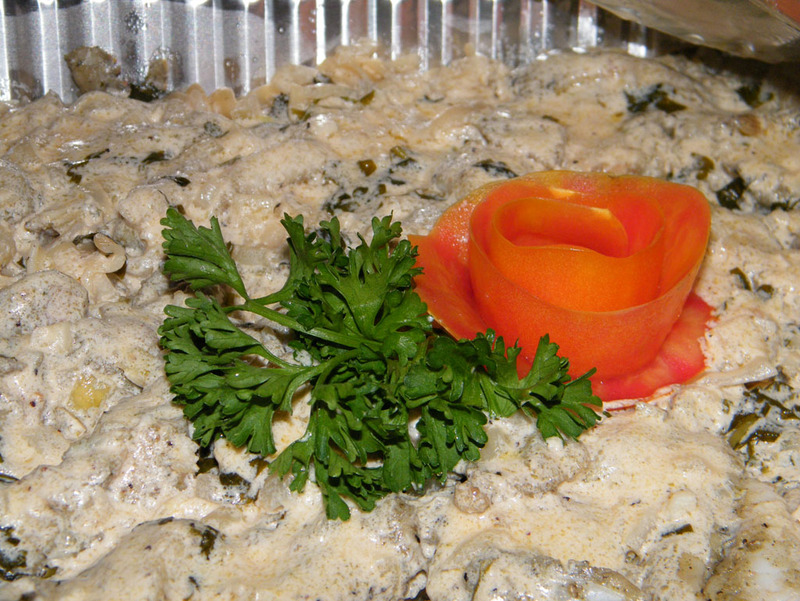 Chino of Wahoo’s created scrumptious lionfish pasta in a basil white wine sauce. Guests were able to sample all of the dishes for a bargain price of $10, and as the line grew, judges and secret judges joined in to sample the four dishes. 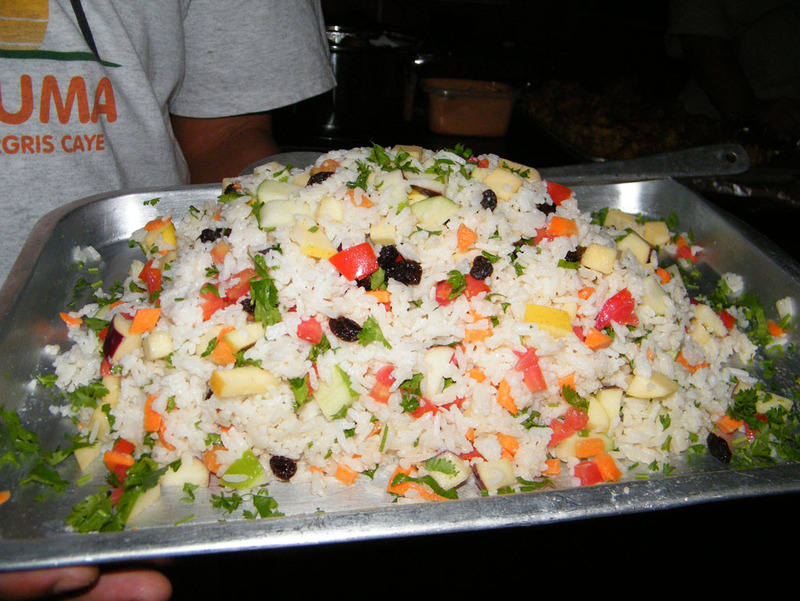 With well over fifty participants casting their votes for the most popular dish, the competition was on. After about a half an hour of tasting and deliberating, the Top Chef creation was decided. 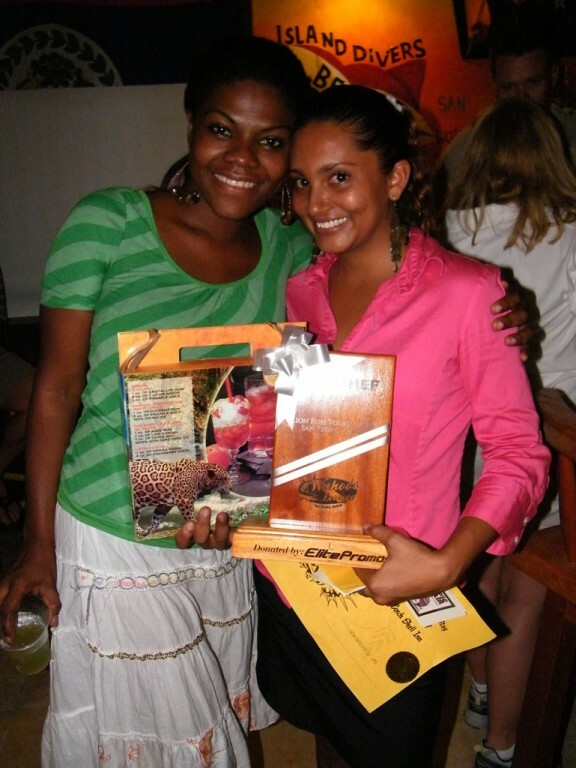 In third place for their Wrapped Lionfish in Casava was Waruguma. 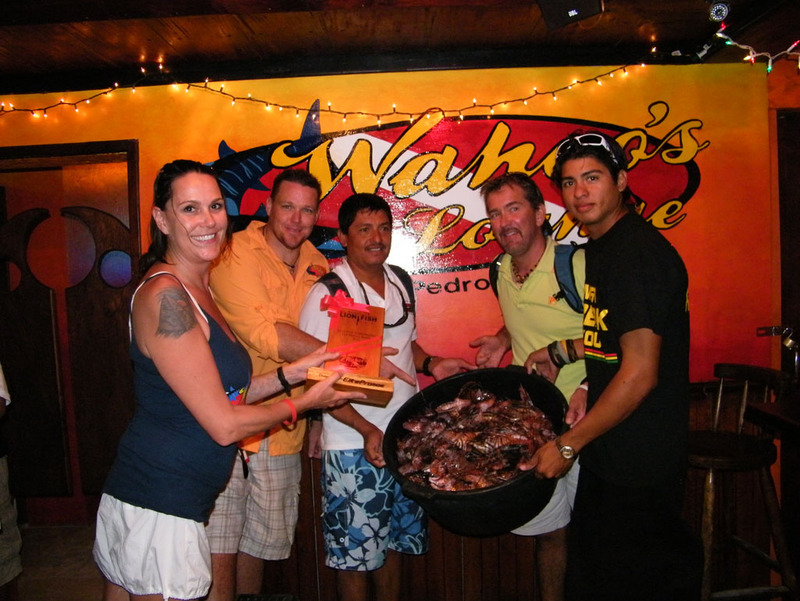 They took home a $50 gift certificate, a rum gift pack and a t-shirt courtesy of Wahoo’s. 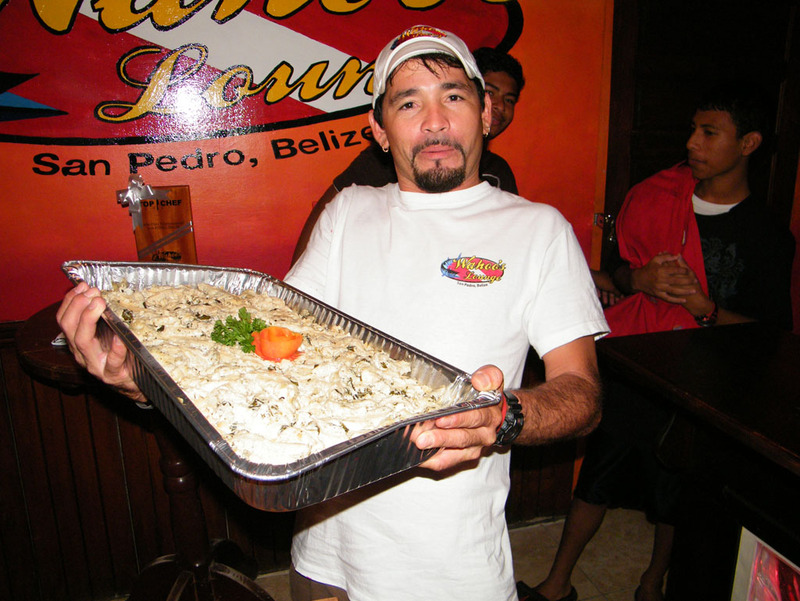 In second place, was Wahoo’s very own, Chino, for his pasta dish. He took home a dinner certificate for two at either, Red Ginger, Blue Water Grill or Caliente, t-shirt and rum pack courtesy of Wahoo’s. 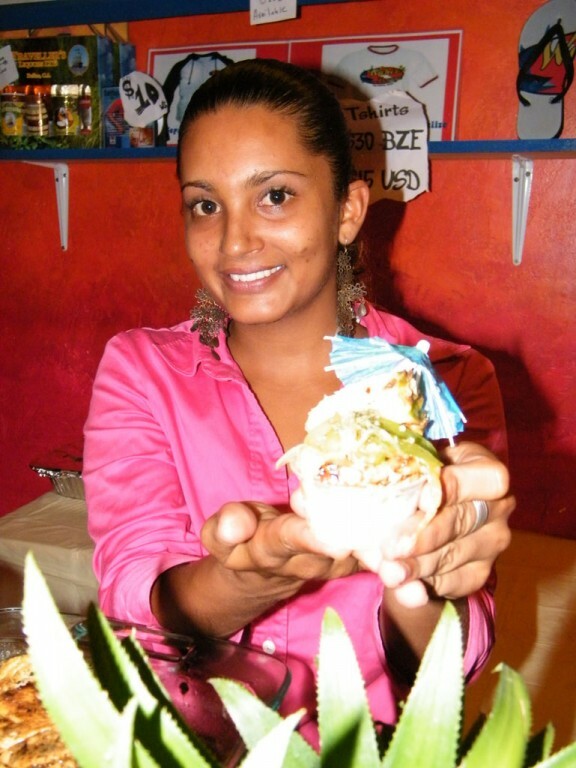 Top Chef for the night was none other than Chef Mar, for her amazing Piña Colada Lionfish. 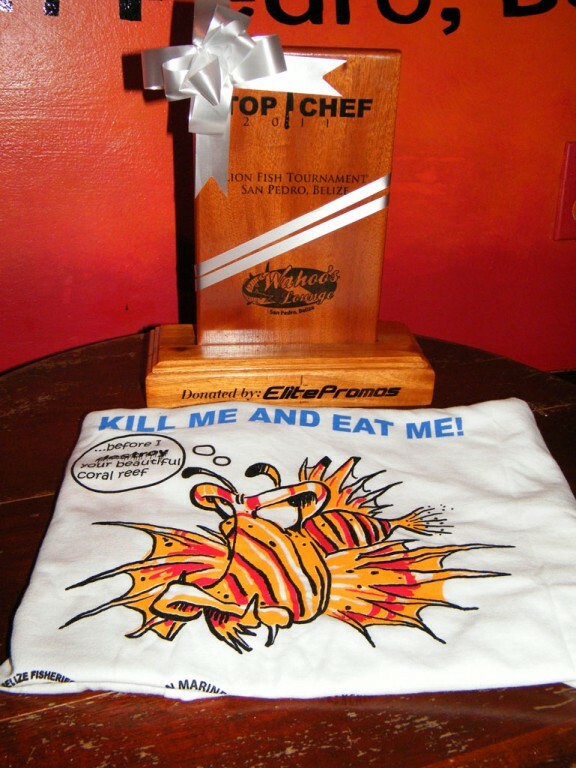 With a huge smile on her face, Chef Mar happily accepted her Top Chef trophy, $200 cash, two round trip tickets courtesy of Tropic Air, a rum gift pack, two nights stay at Conch Shell and a t-shirt courtesy of Wahoo’s. The fight to rid the sea of these creatures continue. 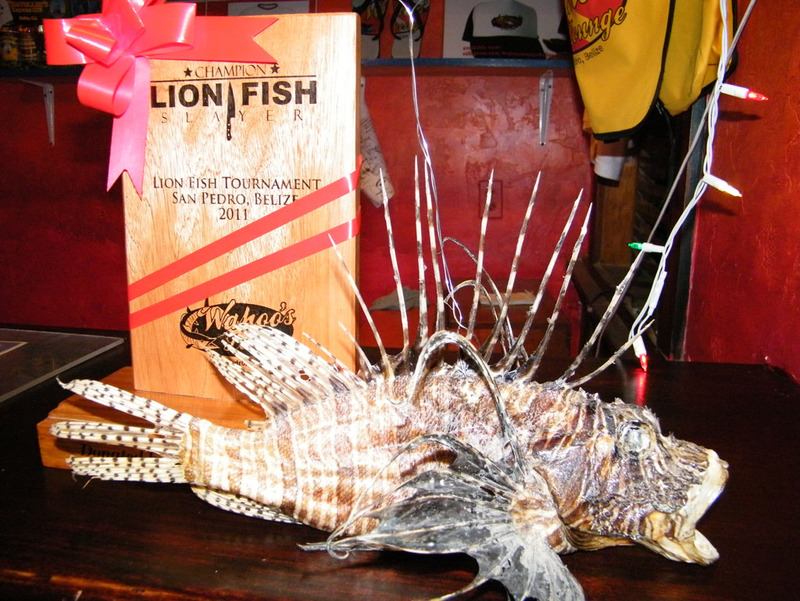 Organizer of the tournament, McClain explained, “It’s not really a competition; it’s just a fun way of getting rid of the lionfish. One of our main objectives as a proud sponsor of this tournament is getting participation from more of the dive shops. We know that it is an expense for them but we are trying to do it at a much lower key and the reason for this is so that on any average day, as they go out with tourists, their dive masters can just go with their spears and shoot as many fish as possible. That’s what this is supposed to be. It is not meant to be a tournament where dive shops have to go out and spend thousands of dollars on fuel and expenses to get in the game”. 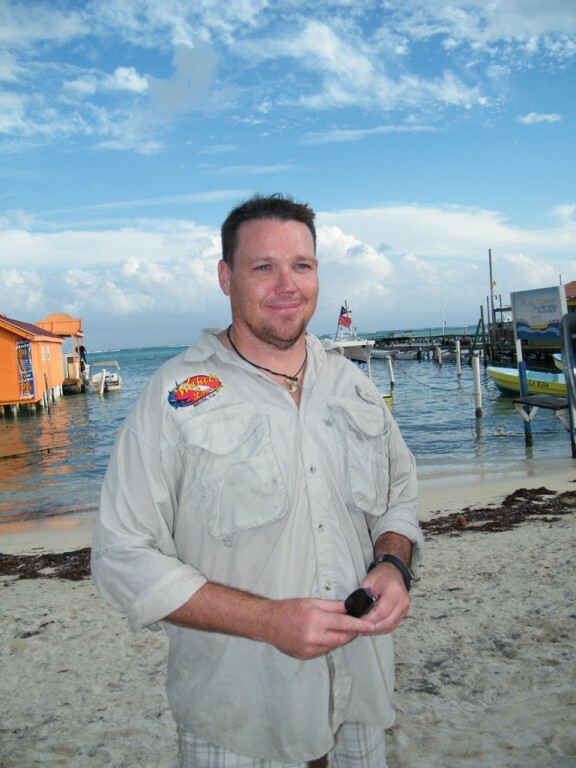 According to McClain, the tournament is just a way of providing some sort of an incentive on a specific occasion, however, it would be ideal if every dive shop would go out and catch these lionfish daily. This could probably be an option for seafood on restaurant menus that would be very affordable. 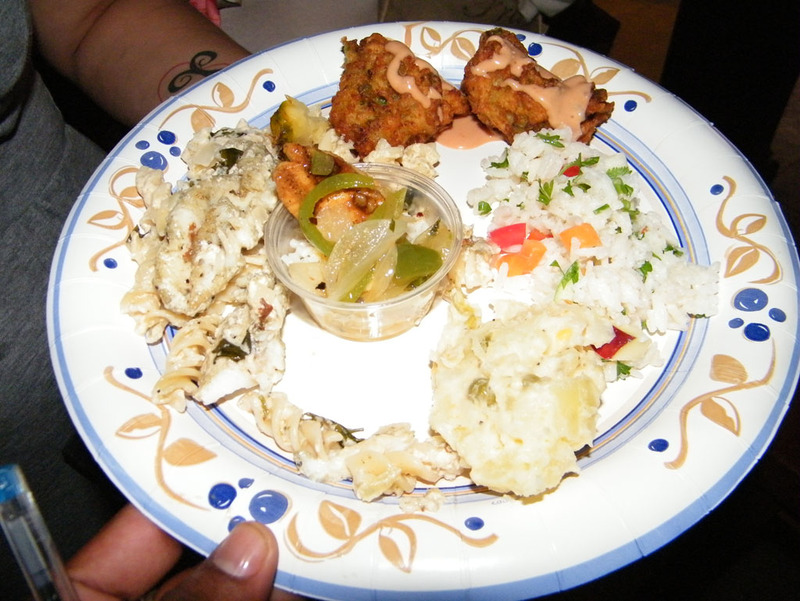 In speaking of the lionfish meals; the King family, new residents to the island and first time lionfish consumer stated, “It’s actually really, really good. They prepared it in so many different ways. 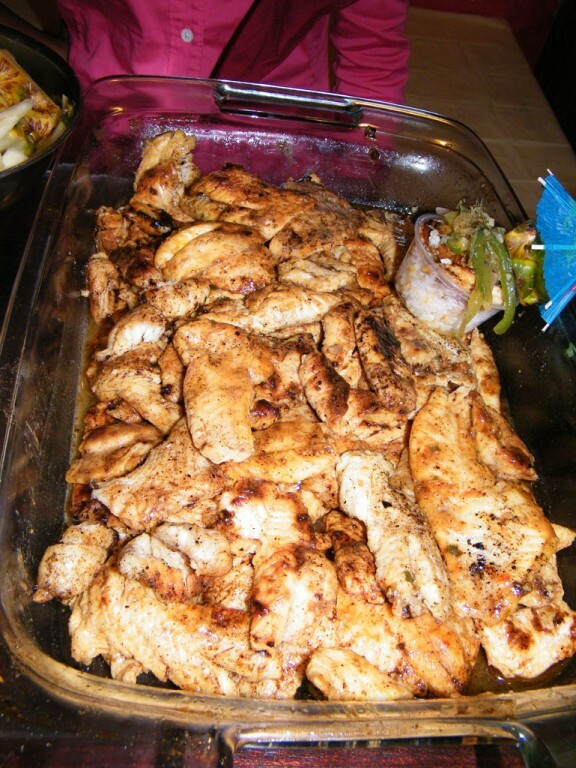 All of it is seasoned very differently but all so beautiful”. And to what it tastes like, they stated, “Sort of like a cross between chicken and fish, the texture of it, it’s really delicious”.